In 1980 Sir James began buying shares in Diamond International, a forestry company that had expanded beyond its core competency, diversifying into product lines such as playing cards or paper plates. The company was losing money, with sales of $1.2bn barely making a profit, but Sir James could see the sum of the parts was worth a great deal more than the whole. Following Diamond’s proposal to take over wood products company Brooks-Scanlon, a bid Sir James didn’t agree with given his correct predictions of an imminent round of recession and inflation, a takeover battle started. Sir James eventually won with a $660m bid that was approved in early 1982. He sold off the Allied Suppliers chain, his last major link with Britain, making more than double what he paid for it in 1972 to fund part of it. He then borrowed two-thirds of the total sum, relying on the return of a bull market to allow him to sell off extraneous parts of the business for a profit. The risks were enormous and the deal had the potential to bankrupt him, but again his timing was masterful, with a market rally beginning just as the deal was closed. By the end of 1983 he had sold off $587m of subsidiaries for cash and still held forestry valued at $723m, making about $500m profit in only two years. The deal was ranked by Fortune magazine as one of the most profitable financial events of the 1980s. Many of the Diamond properties Sir James later sold to pay off his debts ‘flourished without conglomerate oversight’, according to Fortune Magazine – proving wrong those who tried to lump Sir James in with other ‘greenmailers’. Sir James then set out to manage the timberlands, something he studied with great care, and by the time his forests were valued at about $723 million he had no intention of selling. Sir James had also become something of a celebrity, now ranking among the major players on Wall Street. A stream of huge takeover bids followed Sir James’s success with Diamond, including the Crown Zellerbach takeover, which is still studied in business schools today. Even when he failed to buy a company, Sir James often made a good profit. In early 1984 Sir James, through General Oriental, started buying shares in $2.8bn forest products, insurance and energy group St Regis Corporation, which he believed could be a success if it concentrated on core business. He disliked the company’s move into financial services and insurance companies, and later withdrew his takeover bid after disagreements with the deputy chairman over what Sir James saw as a desire to become a conglomerate. Sir James still made a significant profit of about $51m from the sale of his one-month investment and stake. In mid 1984, Sir James offered $2bn for Connecticut-based conglomerate Continental, which had sales of $5bn per annum. Again he believed the subsidiary parts of the business should be sold, leaving the core business, Continental Can, a leader in its field. However the Group accepted a rival bid, with the CEO Bruce Smart later admitting he agreed with Sir James’s views but could not carry them through given he had been elected by colleagues who would lose their jobs in such a reorganisation. Sir James still walked away with $10m in profits and another $25m in private compensation payments. In late 1984, Sir James acquired a $42m (2.4 per cent) stake in soap-maker Colgate-Palmolive, later growing this to more than 20 per cent. However, he decided to withdraw, citing privately that he had come to like the chief executive who sold diversifications and trimmed back to the core business as Sir James would have done. In December 1984, Goldsmith announced his intention of buying 25 per cent of forest products company Crown Zellerbach, another old brand-name legend of America. Again, he felt management were trying to create a conglomerate and expanding into areas they knew nothing about. He saw the most potential in the timber and forestry sides, which chairman William Creson planned to de-emphasise. Zellerbach rejected Sir James’s subsequent offers but he continued buying shares, triggering the ‘poison-pill defence’, and raising his holdings to almost 25 per cent. After being elected to the board and refusing a ‘greenmail’ offer of $100m, Sir James upped his stake to more than 40 per cent and became group chairman. Following continuing disagreements over restructuring plans, he bought a controlling 51 per cent of the company, and finally Creson caved. He agreed to split the company into two, with shareholders having the option of either joining Sir James in the forest and oil company Cavenham Forest Industries, or joining James River, a paper company which had bid for Crown’s paper and pulp business. Forests were unfashionable at this point, so most opted for James River, leaving Sir James with what he wanted: 1.9m acres of timberland at a cheap rate, plus $90m in cash, assets of $330m and a computer company. The cost to Sir James was only $550m and by the end of 1985 he was showing a paper profit on his investment of between $330 – $440 million. Diamond and Crown Zellerbach properties were melded into a single group, with operating earnings rising from $25m to $130m in only five years. Along with better management, the key to success was spending heavily on development: investing in computer systems, upgrading saw mills, and moving oil operations. This bid was the first major takeover bid in the US to be decided in the market place rather than through proxy fights, the first time control had been acquired at less than the bid price (Sir James bought most of his shares in the open market at $41, less than the $42.50 offer Crown had turned down), and the first takeover in which the poison pill defence had been broken – something that wouldn’t be done again for another twenty-five years, when Trilogy triggered Selectica’s pill. The poison pill was developed by Martin Lipton, senior partner of Wachtell, Lipton, as a fool-proof way of making asset-rich corporate treasure-ships look unattractive to unwanted suitors. Once triggered, the device usually allowed management and allied shareholders to put out a new issue of stock at a concessionary price, often with the proviso that outsiders had to pay as much as double for those same shares. In Crown Zellerbach’s case, the Share Purchase Rights Plan, as the poison pill was formally known, had been embedded in the company’s articles and was latent until someone acquired 20 per cent. Once it was triggered, it could no longer be redeemed by the company and theoretically became irreversible. The point of it was that if Sir James, or anyone else, bid for 100 per cent of the company, Crown Zellerbach could buy his stock back at half price – two for one. In other words, if Sir James swallowed the pill, it would cost him many millions of dollars. But Sir James and his advisors had been working on ways to defuse the pill. By buying more than 20 per cent of shares, yet stopping short of one hundred, Sir James landed Crown’s management in an awkward position. Once the barrier was broken, the company could not cancel the pill, meaning any other white knight effectively had to pay twice the going rate for his shares to buy the whole company. 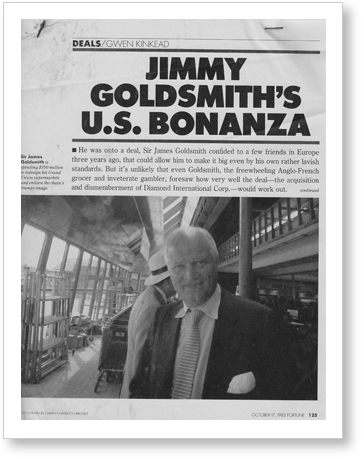 In late 1986, Sir James started acquiring shares in Goodyear, the thirty-fifth largest company in the US, before making a $5.3bn offer in November of that year. Again, he believed diversifications, into areas such as aerospace and oil, had harmed the company. However he sold his $618m stake back to Goodyear later that month, after Goodyear announced they would carry out a similar restructuring plan to what Sir James had proposed, including the sale of their diversifications. The company had also embarked on a public opinion campaign against Sir James, which included pressure for legislative changes to block him taking control. In 1987, Sir James sold almost all of his non-forestry assets, raising around $1bn cash. Once again, his timing and predictions were masterful, with the stock market crashing in October 1987 just after he liquidated almost his entire holdings.